The Daily Caller reports that one of Hillary Clinton’s pay for play organizations, the Clinton Global Initiative is closing down on Tax Day, April 15. The Clinton Global Initiative (CGI) was involved with the rest of the Clinton Foundation in many play for play scandals. For example CGI was involved in Ms. Clinton’s Skolkovo project designed to create a Russian “Silicon Valley.” Sadly were warnings from the FBI that and within Ms. Clinton’s own state department at the time that Skolkovo may have created a legal way for Russia to gain access to America’s classified technology– the kind of access they used to employ espionage to access. 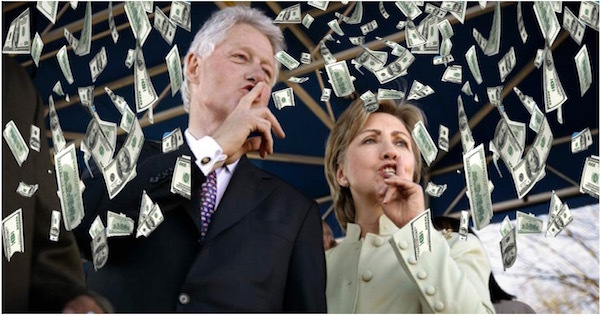 More than the danger to American security, the Skolkovo project enabled former President Bubba Clinton to make a speech in Russian and one in the U.S. which netted him a total of $756K in speaking fees. It was also a boon to Clinton foundation donors. It was Hillary Clinton and her state department that arraigned for US companies to get involved with Skolkovo. Peter Schweizer reported in “From Russia With Money“, 17 of the 28 companies that were ultimately listed as “key partners” in Skolkovo were also Clinton Foundation donors. In the series of emails released by Judicial Watch in October of 2016, Huma Abedin worked with senior Clinton Global Initiative (CGI) executives to set up group photo sessions for Clinton with ‘primary sponsors’ of CGI and members of the CGI staff. In the entertainment world it’s called a meet and greet, you get to meet the star and have some pictures taken. I’m sure it’s even done at the state department for diplomats or foreign heads of government. Doing it for big money CGI donors using taxpayer paid time and the taxpayer-funded offices at Foggy Bottom to aid the Clinton Foundation. It also granted personal access to the Secretary of State Clinton and was pronouncement to the donors the State Department “store” was open, the State Dept. was for sale. Helping a Miami Businessman Rip off the Federal Govt. Hillary Clinton State Dept. pulled strings so that Miami businessman/Clinton Foundation Donor Claudio Osorio could get a $10 million loan from the federal government which he never intended to repay. The money came from the Overseas Private Investment Corporation (OPIC). Mr. Osorio is now serving a 12-year prison sentence for scamming the federal government and others out of millions. After his 2013 sentencing in Miami, the area’s largest newspaper tied him to the Clintons and President Obama as a campaign donor who held fundraisers at his waterfront home, but the foundation was not mentioned. The Free Beacon eventually connected the dots after obtaining a document that shows a OPIC official recommending funding for Osorio’s Haiti project. In another Judicial Watch release we learned of a Huma Abedin/Doug Band email exchange that helped Crown Prince Salman of Bahrain get a meeting with Secretary Clinton. The Prince first requested requested a meeting with Secretary of State Clinton, Hillary said no. But when he went through the Clinton Foundation where he was a huge donor the meeting was set up within forty-eight hours. According to the Clinton Foundation website. in 2005, Salman committed to establishing the Crown Prince’s International Scholarship Program (CPISP) for the Clinton Global Initiative. And by 2010, it had contributed $32 million to CGI. The Kingdom of Bahrain reportedly gave between $50,000 and $100,000 to the Clinton Foundation. And Bahrain Petroleum also gave an additional $25,000 to $50,000. CGI helped the PepsiCo CEO gain access to Secretary of State Clinton…well that and almost eight million dollars. PepsiCo Inc. CEO Indra Nooyi also had at least three scheduled contacts with Clinton. In February 2010, Nooyi and General Electric Co. CEO Jeff Immelt met Clinton as part of the State Department’s efforts to secure corporate money for an American pavilion in China’s Shanghai Expo in May of that year. Nooyi talked twice with Clinton by phone in 2012, a year when PepsiCo spent $3.3 million on lobbying, including talks with State Department officials. PepsiCo’s foundation pledged in 2008 to provide $7.6 million in grants to two water firms as a commitment to the Clinton Global Initiative. The Clinton charity also listed a PepsiCo Foundation donation of more than $100,000 in 2014, the same year the soda company’s foundation announced a partnership under the charity to spur economic and social development in emerging nations. There many more examples of the Clinton Global Initiative’s suspect programs, many of which can be read in the must read book Clinton Cash, and for examples that were revealed after the book was release you can scan all the article about the CGI written for this site by clicking here. In less than four months the CGI will be no more. While the Democrats will whine and complain that it was an organization that did good things for the world, with Hillary losing the election the CGI has actually out run its purposes which was to use Hillary Clinton’s position in government to make money for the Clinton Foundation and to line Bubba and Hillary’s pockets. The rest of the Clinton Foundation will still operate.